PLOT: The story of Eddie Edwards, the notoriously tenacious British underdog ski jumper who charmed the world at the 1988 Winter Olympics. Being a teen in the eighties, the story of Eddie ‘the Eagle’ Edwards tales is a familiar and heart-warming tale of Britishness to the max. A tale of a plucky loser who had a dream and didn’t stop until it was achieved. But while Eddie was a dreamer, he was one whose dreams were capped in reality by unlikely, but entirely possible ambitions. Eddie didn’t believe he was going to be a gold medal winner (or even that he would win ANY medal), but as the founder of the modern Olympic Games Pierre de Coubertin famously said “The most important thing in the Olympic Games is not winning but taking part; the essential thing in life is not conquering but fighting well”, and Eddie certainly was a fighter. 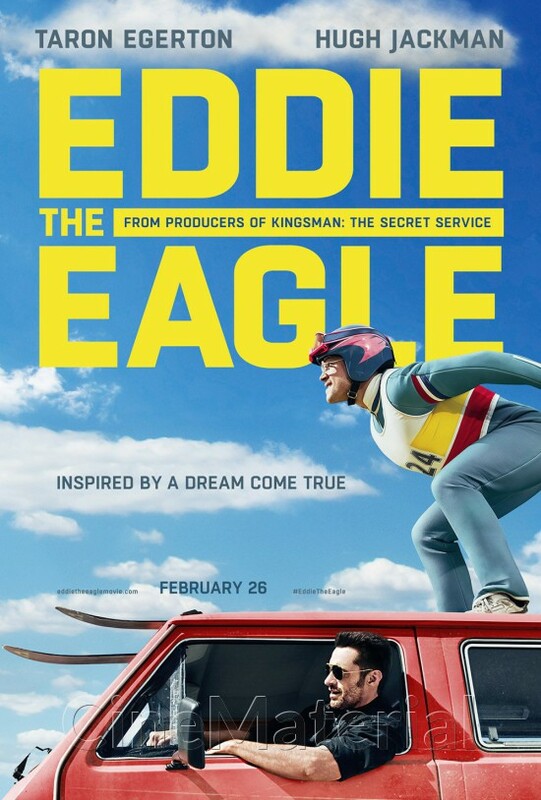 Eddie the Eagle takes basic bones of Edwards’ true story and weaves an almost entirely fictional, but amusingly quaint tale of hope, failure and redemption. This unsurprisingly brings comparisons to the 1993 film Cool Runnings, which told a similarly made up tale of hope, failure and redemption based on Jamaican’s first ever Bobsleigh team and their exploits at the very same tournament as Eddie. The difference between these two films however is both subtle and huge. Whilst the wholly American (in terms of writing and spirit) Cool Runnings upgraded the Jamaican teams exploits, putting them in contention for a medal (and even a world record) only for a mechanical issue to cause them to crash, Eddie the Eagle stays true to the reality that Eddie did well just to come last. Eddie’s glory came from simply competing on the Olympic stage and the film tells us that there is nothing wrong in celebrating that. 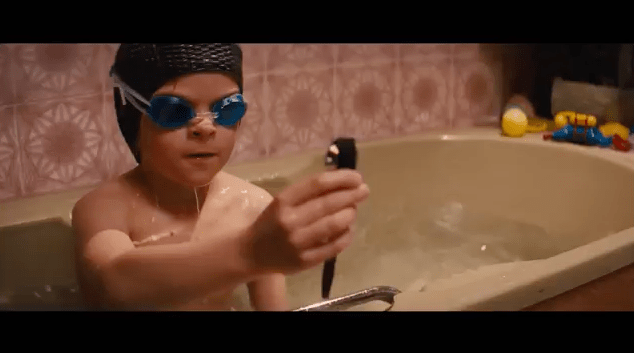 The film starts with a 9 year old Eddie who, despite spending a year in hospital due to ‘knee problems’, still dreams of Olympic glory. In the face of his father derision (played excellently by Keith Allen) he spends all his free time miserably failing to master the pole vault, hurdles, hammer throwing and all manner of other athletic events. His mother (Jo Hartley) on the other hand is always ready with a bandage and an encouraging cheer. When she gives Eddie a tin ‘to keep all your medals in’, it isn’t long before it is full of Eddie’s broken spectacles from his various training mishaps and so, realising the size of his task, Eddie has an epiphany and declares ‘I am not going to go to the Olympics anymore, I am going to the winter Olympics!’. A young Eddie tries his hand at one of many ill-suited sports. Switching to downhill skiing is a masterstroke as Eddie shows an aptitude for downhill skiing and a few years later he manages to record times good enough to attend a selection event for the British Olympic squad. Whilst there he inadvertently knocks over a whole troupe of skiers in front of potential sponsors causing the snobbish committee head (Tim McInnerny) to robs him of his dream and declare that Eddie ‘will never be Olympic material’. Just as a dejected Eddie starts to accept that his dream is over he spies a poster of a Ski Jump slope and sets about researching the British team. Finding that there hasn’t been a British entrant since 1929 and that the qualifying rules hadn’t been updated in 52 years, Eddie realises that all he needs to do is to land a competitive jump and he will automatically qualify for the 1988 Calgary Winter Olympics. 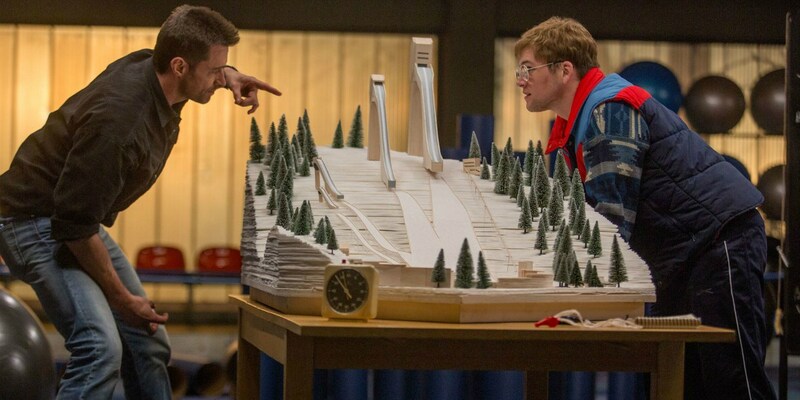 With no money and very basic equipment, Eddie heads to a Ski Jump training camp in Germany where he meets drunk, washed-up, ex-jumper Bronson Peary (Hugh Jackman) who is now working as a snow groomer. In an attempt to prove himself to Peary and get him to be his trainer, Eddie jumps from the 40m slope only to crash land and injure himself. Through Eddie’s blind tenacity and their shared ostracisation from the rest of the Ski Jumping community, Eddie and Bronson eventually team up and set about making a real jumper out of the plucky but hapless Englishman. Eddie teams up with disgraced ex-jumper Bronson Peary (Hugh Jackman). 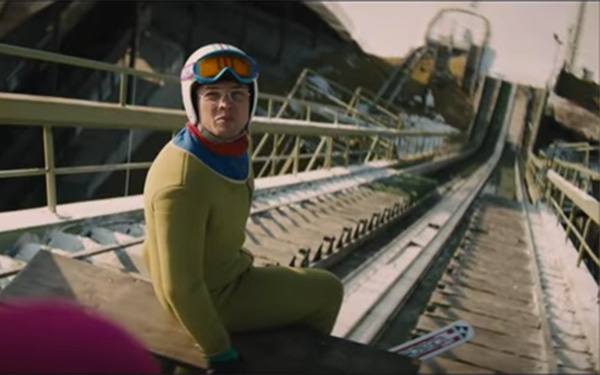 Despite Eddie’s eventual qualification and no doubt in part due to Bronson’s need for redemption within the sport rather than the ridicule he believes is inevitable, the pair fall out and Eddie heads to the Olympics alone, where he is mocked and sabotaged by his own team mates and the skiing community as a whole. But the movie was billed as the ‘feel-good film of the year’ so we are of course treated to a very British version of a happy ending as Eddie lands his jumps and although he finishes last, Eddie captures the hearts of the crowd and of the millions watching on TV. The film delivers on all of its promises, including just enough of the real story whilst adding in some great characters and performances to an amusing and engaging new tale. Egerton and Jackman are superb (though Egerton sometimes struggles to get beyond Eddie’s stifling under-bite, coming across a little hammy in places) and it is obvious there was chemistry between the pair. The cameos from the likes of Christopher Walken, Jim Broadbent and Mark Benton are welcome as are the quality supporting performances. The score by Matthew Margeson is also of a very high standard as its 80s synthpop sound is perfectly suited, evoking memories of Vangelis and Moroder and interspersed by well-chosen period pop songs. However it is a little disappointing to hear that as well as an OST, there is also a blatant cash-in album ‘inspired by’ the film and curated by Gary Barlow that appears to be nothing more than a disparate collection of pop songs with references to eagles and flying. With a relatively small budget $23m the production falls down in places, not least with the obvious use of CGI for Eddie’s crash sequences that suffer from the characters appearing to have no weight (which is apparent on even the biggest budget films – Marvel Studios I am looking at you!). Also, some of the ‘in-flight’ shots substitute realism for a more cartoony feel. But director Dexter Fletcher has done a great job overall, especially in the way that the audience get a true sense of the height of the slopes, triggering a few bouts of mild vertigo whilst I was sat in the cinema. You get a great sense of just how high the slopes are. It is important to note that whilst I knew the true Eddie Edwards story well, I was accompanied to the screening by a friend who had never heard of Eddie. Whilst I found the tale to be uplifting and heartwarming, he found it entertaining but overall a little schmaltzy and pointless, commenting “It just felt like a story that didn’t need to be told, he doesn’t even win anything. I thought he might at least get a bronze at the end”. I take that as an indictment of the unfortunate Americanisation of our culture and the disappointing push towards winning at all costs that has brought so many to succumb to cheating and drug taking in order to succeed. Eddie the Eagle and Eddie Edwards himself embodies a pure Olympic spirit and I hope the wider audience buy into this. Just like Eddie, Eddie the Eagle is unlikely to be on any podium collecting awards (except maybe from our own Academy), but to quote Pierre de Coubertin one more time “The important thing in life is not victory but combat; it is not to have vanquished but to have fought well”. Well fought Dexter Fletcher, well fought screenwriters Macauley and Kelton, well fought Taron Egerton and Hugh Jackman, well fought Lionsgate films and most importantly, well fought Eddie ’the Eagle’ Edwards. Eddie the Eagle was released on 28th February in the US and is released on 26th March in the UK. The Jamaican bobsleigh team have just lost their place on the podium! Eddie the Eagle is, in Eddie’s own words ‘very, almost, nearly’ the perfect feel-good, family film.